Do you have Sussex chickens, or just love the breed? 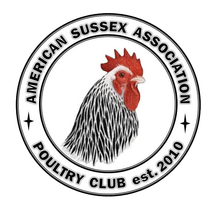 Join us in promoting the Sussex Chicken by signing up to be a member of the American Sussex Association today. Membership has many benefits including listing in the breeders directory, eligibility for club awards and access to our members only Facebook group. The American Sussex Association was founded in 2010 by a group of poultry fanciers who shared a common interest in the Sussex breed and its many beautiful varieties. This organization was founded to assist in spreading information about this fine dual purpose breed of chicken, and the poultry fancy as a whole. The American Sussex Association is dedicated to the improvement and preservation of both the American and English bred Sussex lines. Furthermore, the American Sussex Association promotes breeding both standard and bantam fowl to the American Poultry Association and American Bantam Association Standards for exhibition. Our founding principle is to promote interest in, and knowledge of all Sussex varieties and to foster sportsmanship, goodwill and friendship among all Poultry Fanciers. We welcome breeders and hobbyists of any size, and fanciers of the breed to join our organization and help to promote the Sussex Chicken. Donate To The ASA Today!